Posted on April 9, 2015 - Get free updates of new posts here. 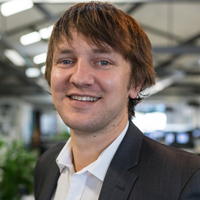 Twitter has definitely been a slow mover in terms of creating and launching their own self service ads platform but the good news is that businesses in New Zealand can now run their own Twitter ads. There are a huge range of ad types and targeting you can use but the one I am most excited about is Twitter Remarketing. These ads give you the ability to market to people who have previously visited your website and who know your brand already which can be an incredibly targeted way to generate new customers or to push new offers to past customers. Setting up remarketing is an easy process, simply follow the steps below and you’ll be good to go. Step 1: Sign up for Twitter Ads (and a Twitter account if you don’t have one): https://ads.twitter.com/login. 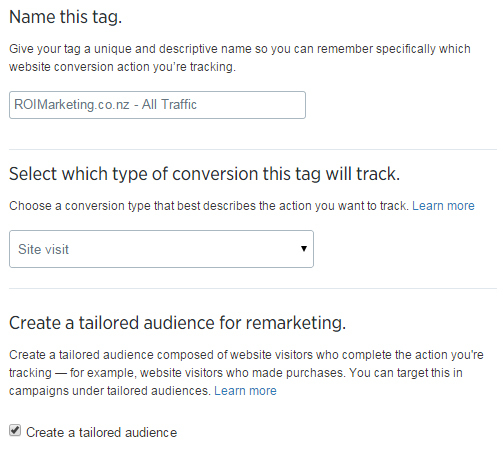 Step 3: Create a name for the tag such as ‘Sitename.co.nz – All Traffic’ and pick ‘Site visit’ as the tag type leaving ‘Create a tailored audience’ selected. 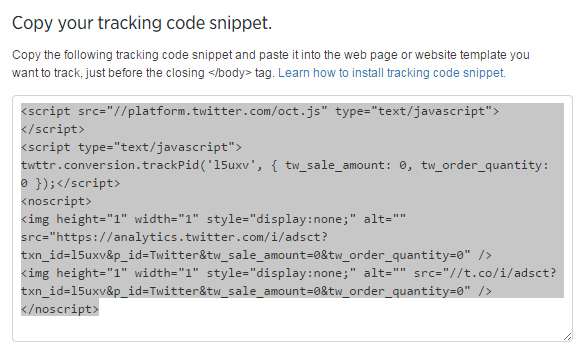 Step 4: Click ‘Save tag and generate code snippet’ and copy the tracking code snippet generated. Step 5: Place the code onto your website and landing pages. The easiest way to do this is into the footer of a site template so it appears on all pages or just send it across to your web developer to add. This code should be on all pages directly before the closing </body> tag if possible. Step 6: Once you have built a large enough audience you will then be able to create Twitter Ads targeted to just your remarketing audience. Step 1: Create a new campaign selecting the focus for the ads you would like to run (Followers, Website Clicks etc.). Step 2: Select the standard targeting options such as Location, Language and then under ‘Select additional targeting criteria’ choose ‘Add tailored audiences’ and browse & find the audience you setup previously. 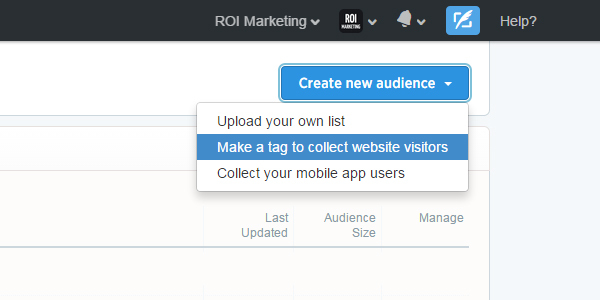 Step 3: For initial campaigns ensure you uncheck “Expand reach by targeting similar users”. You can test this later but it will dilute the effectiveness of your campaigns so it is best practice not to use this option unless you need to substantially increase the volume of users that see your ads. Step 4: Pick your bid, budget and other settings (ensuring you track each advert) and then launch the campaigns. Step 1: If you are running conversion focused ads (which you should be) and would like to stop your ads from showing to people who have already converted (such as a lead you’re already talking to) then go back to Tools > Audiences and create a new website tag as per the steps you followed previously. Name this tag ‘Converted’. Step 2: Add the tag that is generated to just the success/thanks page shown to a user after they successfully convert. This will now start building an audience of people who converted on your website. Step 3: Create a campaign as per the previous steps however when you get to the option “Limit targeting by excluding tailored audiences” browse for and select the ‘Converted’ audience you previously set up. Your ads will now not show to people who converted in the past. Step 4: This new audience can also be used if you want to market new offers to just past customers or prompt them to leave reviews and reorder. You cannot build a remarketing audience retrospectively so its important that you add these tags onto your website as soon as possible. Even if you’re not likely to start remarketing for a few months or even years your audience will continue to build and will ensure that when you finally start this type of marketing you will hit the ground running. While you’re at it, set up your Facebook Remarketing tags by following these instructions. Google’s Mobile Algorithm Update: Today Is The Big Day!